Side Dumping WagonIntroduction of Side Dumping Wagon: Founded in 1992, Siton machinery manufacturing Co., Ltd., is a professional side dumping wagon manufacturer in China. 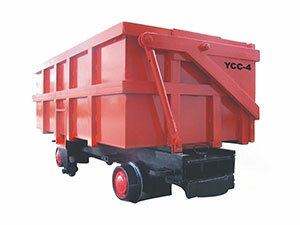 This side dumping wagon, also called side dump wagon, is a kind of wagon typically used in coal mining field. During the operation of the tramcar, the side dumping wagon turns out the unloading and resets automatically by passing the dump rail. The side dump equipment, also called side dumping machine, is typically used in underground mining industry. The side dump equipment or side dumping machinery, during the operation of the tramcar, turns out the unloading and resets automatically by passing the dump rail. It can work efficiently with security and reliability. By drawing of engine or winch, it unloads materials automatically. Here in Siton, we mainly offer fully hydraulic side dumping rock loader and side dumping wagon used as mining side dumpers. Please refer to the related pages for more detailed information. This side dumping machine is applied in colliery of underground mining, earth surface mining, mental mine and other non-mining area. Along with the subsurface roadway, it can be used to transport mineral, mullock and other materials.